Elliott Ranch is a scenic community that offers discriminating buyers a choice of one to three acre home sites to choose from. Situated among 547 tree covered acres of rolling hills buyers can decide between flat lots with trees, lots that back to a greenbelt or maybe a view is their preference. Elliott Ranch provides residents a gated community with most lots being at least 200 feet in width, spectacular views, green belts, a public water system, and is protected by community restrictions, covenants and maintains architectural controls. Whichever home site and home style they choose, Elliott Ranch offers a community for its residents that is harmonious with the surrounding natural beauty. If nature and all its beauty are what you crave, Elliott Ranch offers the bounty of nature right at your fingertips. An 81 acre greenbelt, with a creek is available to homeowners for their enjoyment. Away from the hustle and bustle of busy streets and city living, Elliott Ranch can be your own private retreat. Surround yourself with the natural beauty of rolling hills, trees and wildlife, yet be located just a few miles west of the growing community of Buda and a few miles southwest of Austin. 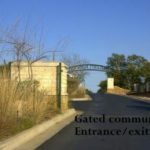 Elliott Ranch is a gated community located Southwest of Austin in the Northwest area of Hays County. It is located on Elliott Ranch Rd. off of Country Oaks. Many twist and turns will lead you to this beautiful community.